Wake up to a smoother, clearer complexion with Overnight Exfoliating Treatment from Good Molecules. This blend of 10% alpha and beta hydroxy acids helps to resurface and renew, smoothing away dead skin cells and unclogging pores to reveal visibly radiant skin. *Diminish the visible signs of aging with smooth and brighter skin caused by glycolic acid and lactic acid that exfoliate the skin’s surface. *Reduce breakouts and blemishes as salicylic acid penetrates deep into pores to dissolve clogs. Apply a few drops to clean skin at night up to three times per week. Let sit for several minutes before continuing with your routine. May cause irritation if used with retinol or other acids. Always wear sunscreen when alpha hydroxy acids are part of your routine. If your skin is very sensitive, we recommend using once per week until your skin builds tolerance. Note: This product contains a small amount of citrus essential oil in a concentration that is not known to cause photosensitivity. As with any new addition to your skincare routine, we recommend patch-testing prior to use. Wake Up with Better Skin! WOW! I've honestly only used this once so far and I love it already! My skin is getting over a recent breakout so it's been really textured, plus this cold weather is making my face feel really dry. 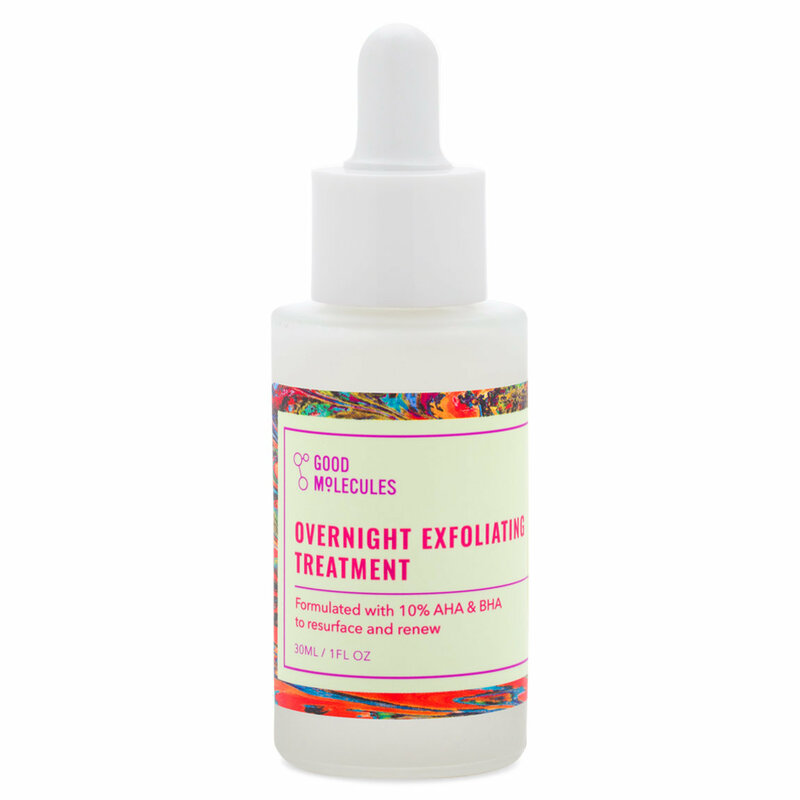 I applied one dropper full of the Good Molecules Overnight Exfoliating Treatment to my entire face before bed, then followed with the Good Molecules Squalane Oil. I really liked that it didn't make my skin feel tight or dry, just a slight tingle, but that's pretty normal for AHA/BHA treatments. The next morning, there was a noticeable difference in my skin! 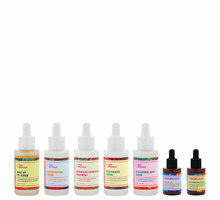 My pores were a lot smaller, my existing acne had slightly reduced in size, and overall, my skin was a lot smoother. It's comparable to a lot of AHA or BHA products I have used in the past, but honestly, nothing beats the price. Can't wait to see how my skin looks in a few weeks! I am an exfoliation aficionado and this serum is quickly becoming my go-to. There is a little tingling sensation upon application which I appreciate (that means it's working, right?!) but nothing too crazy. I let this absorb, then I follow up with the Niacinamide serum and then my oil and eye cream. I love the addition of hyaluronic acid to this formula because it keeps my skin from feeling dry. When I use this treatment, I wake up to smoother and visibly tighter skin with no redness. I plan on using this on my décolletage a few days a week because I've started to notice some slight wrinkles and discoloration but for the price, I can afford to slather this serum all over. The packaging is also very well done. Great product! I am pretty new to the world of peels, but the Overnight Exfoliating Treatment has made me a believer. To start, I really like the packaging. It feels like a really thick glass bottle, and I love the stopper inside the bottle that takes away excess product from the dropper. Even though I have not used a peeling treatment before, my skin actually did not tingle when applying. I could noticeably see my skin was brighter and smoother the next morning and got super excited! I now use this treatment about three times a week, and I continue to be extremely happy with the results I see the following day. For anyone who hasn't used a peeling solution before but is interested in trying one, I highly suggest this one from Good Molecules. It's gentle enough for beginners, but potent enough to quickly show noticeable results. I bought this on a whim and I was so excited to test it out. I used it one night and then next morning I could see a visible difference in my skin. Amongst other things, my skin is smoother and brighter. Somehow my redness is also toned down as well. This is worth every single penny. My skin is bone dry and prone to redness but this works so well for me, I just top with the squalene oil or a nighttime moisturizer. I was a little scared that this product would be to harsh for my slightly sensitive skin! But I was so wrong! I use this before bed once or twice a week and I wake up with skin that looks like brand new baby skin!! Even the first time I tried it I could see the difference! My skin looks smoother, brighter and healthier! I take good care of my skin and has always had "good" skin, but after starting to use this treatment I have had several people ask me what I am using since they can see a change in my skin! I use this at least 3 times a week. I love the product dropper because you don't ever use too much. I am 63 years old and I believe this overnight exfoliating treatment makes my face glow. This stuff is bomb. I feel like it could replace any high end exfoliating treatment that is in the same category, but it's like...6$. You know it's good when you get that strong tingly feeling when applying it. The acid content is high, which means it is doing it's job, sloughing off all the dead skin cells! I woke up with better skin every morning after I've applied it so far. This helps with texture issues as well as breakouts! LOVE! This is an incredible exfoliating treatment! It really has helped my acne breakouts and has smoothed my skin tremendously. At night, I cleanse my face, tone with a facial spray and then layer this on before moisturizer. I wake up with glowing and smooth skin. I will definitely be repurchasing! I see a noticeable improvement in my skin texture and it also seems to be helping with my large pores and oily areas. My skin is somewhat sensitive but I have been able to use this every night for the past several nights with no negative effects. Highly recommended!